By default, WordPress displays the last 10 posts. You can change this to display a different number of posts. 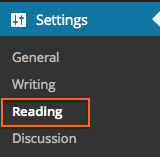 Select Reading from the Settings toolbar in the lower left of the Admin area. Change the number in the Blog pages show at most field from 10 to the number you prefer.